“George’s mystery unfolds with great psychological depth, finely drawn characters and gorgeous portraits of the English countryside. . . . [George] is an essential writer of popular fiction today.” —The Washington Post The #1 New York Times bestselling author’s award-winning series returns with another stunning crime drama featuring Scotland Yard members Detective Inspector Thomas Lynley and Detective Sergeant Barbara Havers. The unspoken secrets and buried lies of one family rise to the surface in Elizabeth George’s newest novel of crime, passion, and tragic history. As Inspector Thomas Lynley investigates the London angle of an ever more darkly disturbing case, his partner, Barbara Havers, is looking behind the peaceful façade of country life to discover a twisted world of desire and deceit. The suicide of William Goldacre is devastating to those left behind who will have to deal with its unintended consequences—could there be a link between the young man’s leap from a Dorset cliff and a horrific poisoning in Cambridge? After various issues with her department, Barbara Havers is desperate to redeem herself. So when a past encounter gives her a connection to the unsolved Cambridge murder, Barbara begs Thomas Lynley to let her pursue the crime, knowing one mistake could mean the end of her career. 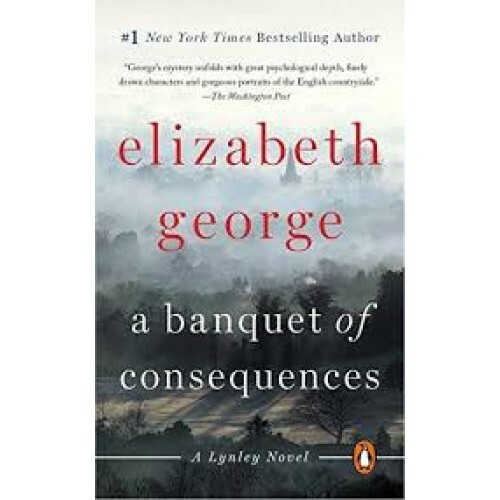 Full of shocks, intensity, and suspense from the first page to the last, A Banquet of Consequences reveals both Lynley and Havers under mounting pressure to solve a case both complicated and deeply disturbing.